Recurring deposit schemes are a wonderful way to build your savings over a period of time through regular monthly deposits. Not only do you save money but also earn interest on your deposits. Continue reading to see what IDFC bank’s recurring deposit options have to offer.t. RD interest rates up to 7.25% are offered with interest compounded quarterly. The deposit tenure ranges from 6 months to 120 months. TDS deductions will be as per existing income tax rules at the time of RD account opening. You can open your RD account by visiting your nearest IDFC bank branch. 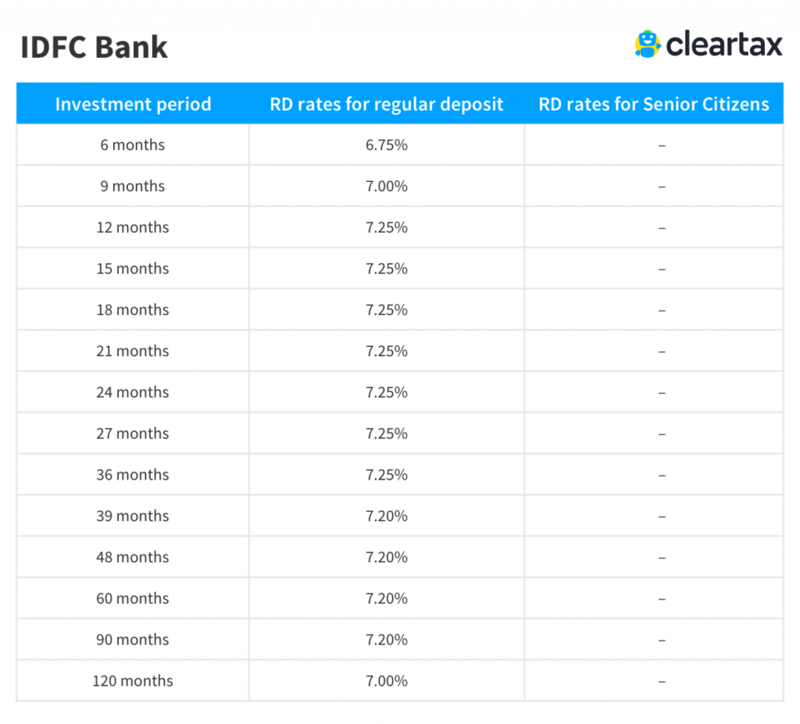 IDFC Bank Recurring deposit: Is it the best way to save? Saving a specific amount of money every month can lead to a substantial amount for the emergency fund in the long term.Recurring deposit options can be availed to do so. However, they are not the best saving option if wealth creation is the objective. Let’s see you plan on saving for your retirement. A Recurring Deposit with 7.25% interest rate may not give you the returns needed to create a decent retirement fund. However, depositing the same amount in a Mutual Fund as SIP (Systematic Investment Plan) can help you create the kind of wealth you are aiming for. A small amount of money that can be as low as Rs 500 has to be deposited by you every month or every quarter. You need to have pre-existing savings account with IDFC bank or open a new one. Documents for age and citizenship proof are needed as well. No penalty is levied in case monthly payment is missed. However, in case of premature withdrawal, some penalty may be levied based on bank policies. All recurring deposits, including IDFC bank recurring deposit, are taxable under the Income Tax Act 1961. The money that is invested in RD will be included in your yearly income and a TDS ( Tax Deducted at Source) of 10% is applicable on the interest earned ( If it is more than (if it is more than RS. 10,000 per year).To save TDS on your RD gains, you can fill either Form 15G or Form 15H.